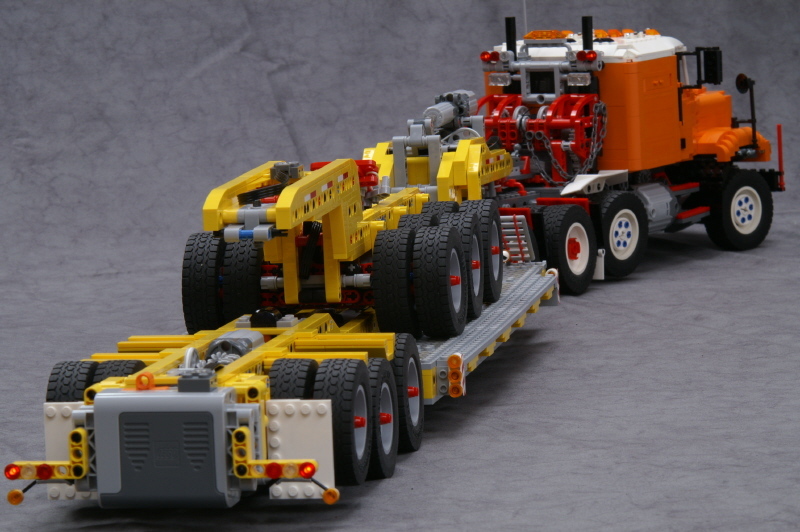 It is not the first time , that 2LegoOrNot2Lego (Ingmar Spijkhoven) shows us a creation of a truck or even a companion trailer. And these days he published great stuff once more. Every new Ingmar model is a step forward when it comes to implement and motorize new functions from real Trucks. 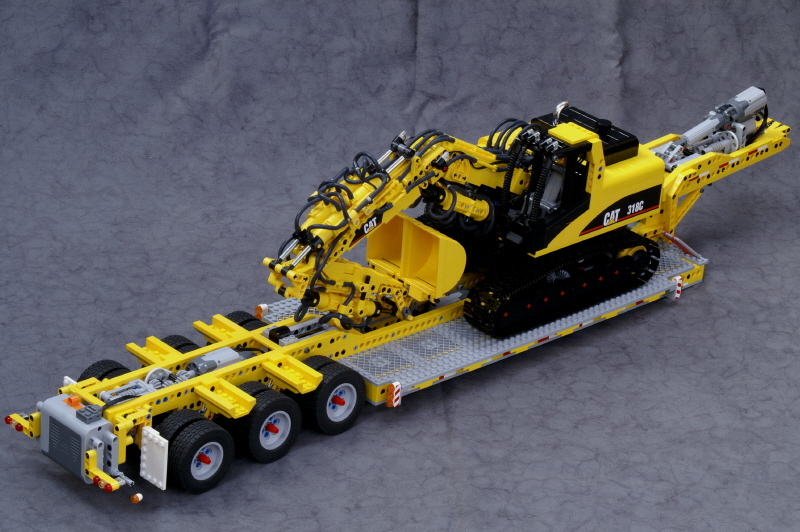 This time he made a nice detailed heavy duty truck with a lowboy trailer both in scale 1:17,5, and again prepared a few videos to show all the functional details of his impressive creations. 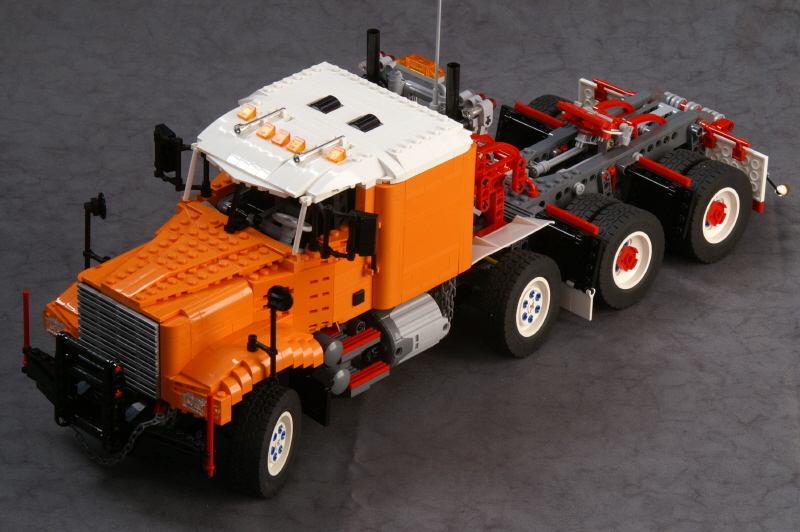 First we will se the US style heavy duty truck with almost 54cm lenght and with a cabin mostly made of orange bricks. It is always a noticeble exercise to try to make a model in a color with a less diversified range of bricks. Solid axle suspension on all 4 axles. Steering system with LEGO Flex Cables System linkages. 2 XL motors two power both rear axles independentely. Ackerman geometry on the two front steering axles. Liftable and steerable pusher axle. Slidable and pivoting fith wheel to attach different trailers. Motorized winch function, to load trailer. Auxiliary PF output to power trailer functions. The model is remotely controlled for most of its functions, using 3x M and 2x XL PF motors. For a more complete description about this model, take a look at this page on Ingmar MOCpages site, or this BrickShelf folder for more detailed images. Second we will also see an US style gooseneck lowboy trailer, made to fit into the heavy truck above. 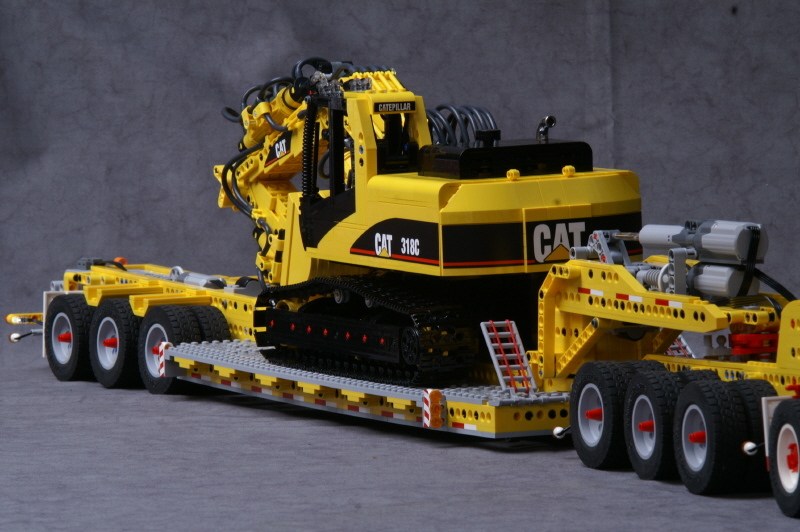 This model also includes a so called jeep or dolly, that often goes with lowboy trailers, to spread load over more axles. Again, at a dedicated page on Ingmar MOCpages, you may read more about this model and all the research required to build and make it work like the real stuff. The images with an huge excavator on board, are well demonstrative of this trailer stiffness. Below two more videos, showing indetail how to operate with the liftboy and the jeep, how heavy machinery loads/unloads and other functions like the 3rd axle lift. Full solid axle suspension on all axles. Truck chassis support on gooseneck. Adaptable jeep or dolly to spread lover over additional axles. Remotely liftable 3rd axle on lowboy. The functions from this model are remotely controlled using 4x PF M-motors. The truck with gooseneck lowboy trailer plus jeep, reach an impressive lenght of 164,8cm (5'5''). For more trailer pictures you should also look at this other Brickshelf folder. I'm looking forward to Legoworld!